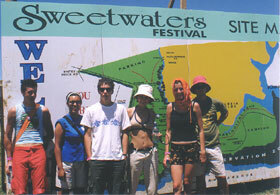 Sweet As documents the three days and three nights of Sweetwaters 1999, a music festival (attended by 25,000) which sought to recreate the legendary Sweetwaters festivals of the 80s. The documentary follows two selected groups – one group in their teens and early twenties (who were experiencing a big music festival for the first time), and a group in their thirties who had come to relive past pleasures and to see if things had changed in the 15 years since the last Sweetwaters. The festival was a financial disaster and workers and performers were left unpaid, but most of the people who were there spoke warmly about three days of music and partying.